If you are considering IVF treatment we understand that IVF success rates will be important to you. It is essential to understand what IVF statistics mean, so you can make the right decisions for your future. What is an IVF treatment cycle? other embryos may be frozen and transferred later (a “frozen embryo transfer” or FET), An IVF treatment cycle is considered complete once all fresh and frozen embryos from the initial stimulated cycle have been used.. When it comes to IVF, there is no agreed standard for reporting "success". Sometimes IVF success rates are quoted per complete IVF collection and treatment cycle. A full IVF collection and treatment cycle can involve multiple transfers of embryos collected from the one egg collection. Success rates measured this way will therefore naturally be higher than success rates measured per embryo transfer. At HunterIVF, we most often measure IVF success rates as clinical pregnancies per embryo transfer. A pregnancy is confirmed by a blood test and ultrasound scan, usually at around 6-8 weeks. Unfortunately, not every pregnancy will carry to a live birth, so we quote live births per embryo transfer as well as clinical pregnancies per transfer.We report our success rates per embryo transferred as we want to give you the most realistic understanding of your chance of success following each individual embryo transfer. However it is important to understand not every treatment cycle will result in an embryo transfer: for some women, no eggs will be collected, and, sometimes after eggs have been collected, there may be no transfer because no embryos have developed. the most important factor determining IVF success rates is a woman's age. When comparing IVF success rates, as well as checking what is being measured, check you are comparing rates for women of the same age. If 'whole of clinic' rates are quoted, consider whether the clinic might, overall, have older or younger clients than average - or do they perhaps send their more difficult cases to a different clinic altogether? Ask how often a clinic transfers more than one embryo with each transfer. More embryos per transfer may make success rates appear higher (this is a key reason some US rates appear higher than ours), but HunterIVF rarely performs multiple transfers, as it can also increase the risks of multiple births, low birthweight and premature births. Check whether the data includes processes like ICSI, or includes frozen embryo transfers or only 'fresh'. At HunterIVF we are proud of the success rates we are achieving for patients. Together with IVFAustralia and our partner clinics in Melbourne, Queensland and Tasmania, we’re responsible for more births through IVF treatment than any other fertility group in Australia. 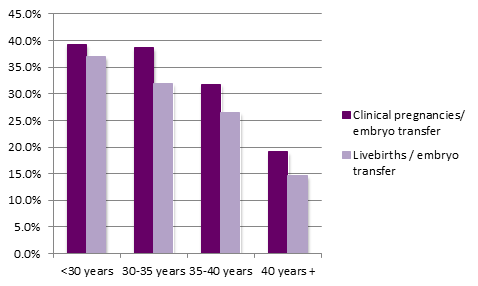 The following graph shows the proportion of HunterIVF patients who had a fresh embryo transfer using their own eggs that resulted in a clinical pregnancy and a live birth following treatment in 2013. The success rates range from 40.1% per embryo transfer leading to a live birth for patients under 30 years, to 8.5% per embryo transfer leading to a live birth for patients over 40 years. It does not include any additional frozen embryo transfers that may have eventuated from that IVF treatment cycle. 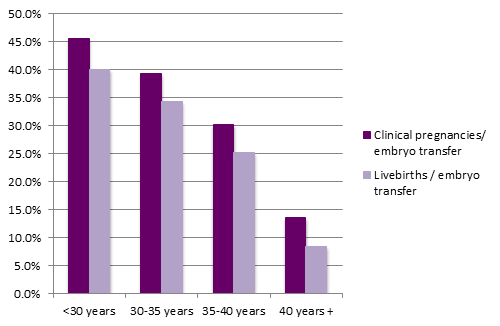 The following graph shows the proportion of frozen embryo transfers using their own eggs that resulted in a clinical pregnancy and live birth in 2013. Want more information about IVF success rates? Understanding IVF success rates can be complex. At HunterIVF we will always carefully explain how any data are calculated. Individual factors also affect every patient's prospects of success. The best way to understand the likelihood of success for you, and your partner, is to arrange a consultation with one of our fertility specialists. Our role is to give you a thorough understanding of your own personal situation, and to work with you to develop the most suitable treatment plan, to give you your best possible chance of taking home a baby. To find out more, please call our Fertility Nurse on (02) 4957 8515. To register for a free fertility information evening, call 4957 8515 or check here for our event calendar. Read more about the range of fertility treatments available.